This entry was posted in photography and tagged 2012, crystallofolia, frost, frost flower, nature, outdoors, photo, Photograph, Photography. I’m glad you got to see and record this phenomenon. Was the plant frostweed? Coincidentally, I know Bob Harms, the man whose web pages on crystallofolia you provided a link to. I am not sure what the plant was. It was more a broken off stalk reminiscent of goldenrod. I have been thinking of trying to mark the area to see what is growing there come spring and summer. If you see Mr. Harms, thank him for the posts about crystallofolia, I enjoyed reading them! I’ll follow your link now and see what you recorded. My guess is that you probably saw Verbesina virginica, frostweed, which is a common plant and the one that most readily produces frost flowers. It’s in the sunflower family, as is goldenrod. Your idea of marking the area is a good one; I know where frostweed plants grow in my neighborhood park, so when we get that first freeze, that’s where I head. I’m still guessing that you saw frostweed. 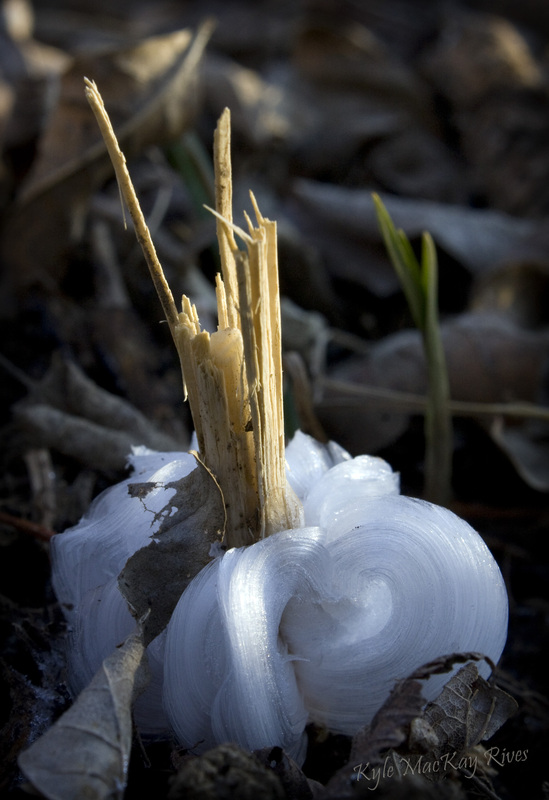 It often produces ice ribbons like the ones in your picture. Success! That Wildflower Center NPIN database, by the way, can help you identify other plants as well. There’s so much to learn (says the professional student).